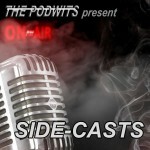 Dion and contributor J. Blake are back for an all new, exciting episode of The Podwits’ Side Cast! The topic today is the man, the myth, the legend…. Bruce Campbell; and all things Mr. Campbell! The boys get into the nitty-gritty and talk about his mainstream successes like The Evil Dead and Burn Notice, but also get into some lesser known gems like Moon Trap, Running Time and Crime Wave, and even some forget beauties like The Adventures of Brisco County Jr.and Bubba Ho-Tep. A mandatory listen for any Campbell or Raimi fan, or any Film fan for that matter!!! Come on down and have a listen!